Synth-wizard Vince Clarke, a founding member of Depeche Mode, was an integral part of the band’s hit 1981 debut album “Speak and Spell.” He wrote hits like “Just Can’t Get Enough” and “Dreaming of Me” for the band, which had an upbeat and peppy synth-pop sound very different than the darker and more melancholy vibe Depeche Mode would develop after Clarke’s departure. He left after one album and formed a short-lived but successful collaboration with dynamic vocalist Alison Moyet. Yazoo (or Yaz in the U.S.) scored with hits like “Only You,” “Don’t Go” and “Situation” in the brief two-year period they were together. Moyet left to pursue a long and fruitful solo career, while Clarke was left to figure out his next move. Three decades later, Erasure is still going strong, having amassed one of the most impressive and consistently entertaining catalogs in pop music history. They’re celebrating the 30-year mark with deluxe reissues of all their albums. Several are out now. Two more will arrive Aug. 19 and the final batch arrives Aug. 26. Details at erasure30.com. A three-disc box set called “Always,” featuring a bevy of rareties, is also out. They’ve scored dozens of hits in the U.K. and elsewhere, while in America they were able to breakthrough briefly with a taste of mainstream success in the ‘80s while mostly finding success in the dance clubs thanks in large part to their ever-enthusiastic gay fanbase. Bell has never been coy about his sexuality, which certainly made breaking Erasure on American airwaves a challenge at a time when almost nobody openly gay was hitting the U.S. Top 40. It’s not easy to write a great pop song, yet Erasure has written dozens of them. Erasure’s music is so irresistibly catchy and memorable, it’s almost impossible not to be swept away by their infectious charm and kinetic electro-pop dynamism. Their debut “Wonderland” yielded a trio of early hits, including “Who Needs Love Like That,” which features a wonderfully campy video with the duo in drag. Their sound developed in maturity with their second album, 1987’s “The Circus” and singles like “Sometimes” and “Victim of Love.” It was their third album, the 1988 pop masterpiece “The Innocents,” that brought the duo the apex of their success. Two classic singles, “Chains of Love” and “A Little Respect,” became Top 20 hits in America and around the world. They remain popular — one way to get a roomful of gay men to sing along at the top of their lungs, trying (mostly in vain) to hit Bell’s high notes, is to blast “A Little Respect” at full volume. It’s arguably their finest moment. More albums followed in rapid succession, every single one of them worthwhile. “Wild!” (1989) featured the ebullient “Blue Savannah,” and 1991’s “Chorus” scored international hits with the high-energy title track and the flamboyant disco-flavored “Love to Hate You.” In 1994 they returned to the American charts with the sublime ballad “Always” from “I Say, I Say, I Say,” which was followed by their more experimental and ambient 1995 self-titled album. Perhaps the most underrated album of their career, 1997’s “Cowboy” includes gems like “In My Arms,” “Rain” and “Reach Out.” The duo toured successfully in support of “Cowboy,” including a memorable show at American University in D.C.
Over the last 20 years, Erasure has continued to tour and release one solid album after another, the most recent being 2014’s “The Violet Flame.” The duo performed two electrifying nights at the 9:30 Club in support of the album, and it was very clear to the exuberant crowd that Erasure has lost none of their considerable firepower. Andy Bell remains one of the most charismatic and compelling vocalists in pop music and Clarke seems armed with a never ending supply of sonic invention. With the reissues — all out on 180-gram vinyl — there’s never been a better time for long-time fans and those interested in delving deeper into their catalog. The quality and quantity of the duo’s work is staggering and sadly does not seem to receive the respect it deserves outside of the duo’s die-hard fan base. It’s time for that to change. 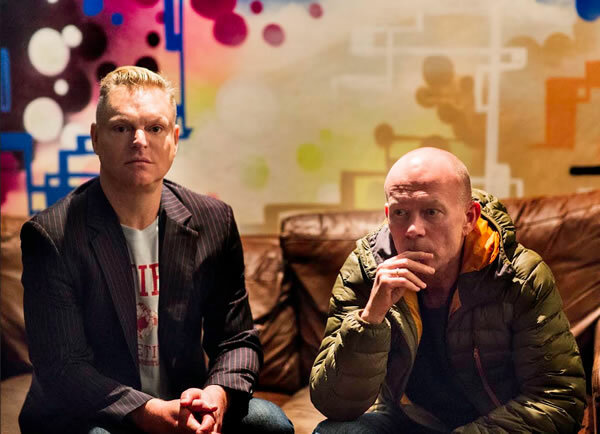 Erasure’s enduring legacy and impressive body of work over three decades is the equal of anybody in the vast pop music universe, and indeed it is time for a little more respect to be thrown their way. Great writing and insight as always!